A gun safe is an essential for any individual who already owns a firearm or is planning to own one. This is not only a safe practice but also an action enforced by law in many states. Choosing the best gun safe depends on some key factors which an individual should emphasize on while purchasing a gun safe for personal use. The term ‘bigger is better’ fits really well in the scenario where you are settling for the gun safe of your choosing. Most of the time people will be settling for a safe that is large enough to fit their armory or collection of antique guns, but one should keep this in mind we are humans and we don’t settle for less. 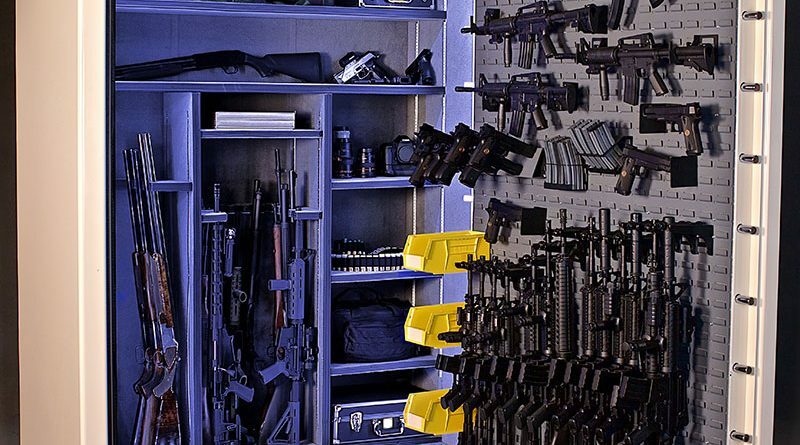 Even if you think you have enough guns in your collection, you’d go on and buy some more and fill the remaining space in your gun safe. The next point of concern for some folks is the weight of the gun safe. Well, no matter how much steel is put into the manufacturing of your safe, no matter how much the same weigh, the whole base of the safe is designed and spread in such a way that it evenly distributes the overall weight of the safe. Therefore, you don’t need to worry about your floor or your stairs, they’ll be fine. There is no accurate and concrete definition of the two that draws a clear line between the two types of enclosures. But laying out the facts in simple layman’s terms one can detect that the difference lies in the specifications and features one is offered by the two. A safe on one hand is something that is impossible for an average person to break into, while on the other hand, a gun cabinet is an enclosure with glass doors used for display purposes. A gun safe is made up of reinforced steel and can be penetrated by the meticulous use of power drills and related tools. Adding to that, a gun safe, in most of the cases, will have some sort of protective lining that offers protection to its contents in case of a fire along with lock and bolt mechanisms for added security. A cabinet, on the other hand, can be easily accessed by the turn of a key or simply by breaking the glass or wooden door. Mechanical locks are the most standard and reliable forms of mechanisms employed as the defensive factor in gun safes. They offer key operated lock in the dial on the door which unlocks the dial all the while preventing the same from spinning. Electronic locks provide the user with both security and safety factor all the while making it easier and faster to gain access to the contents of the safe. Users are often given the option of setting their own set of combination for the safe. The latest in the long line of defensive mechanism incorporated in gun safes is the biometric locks. This mechanism works on the basis of the fingerprint of an individual. One can gain authorized access to the contents of the safe by simply placing his/her finger on the biometric scanner of the safe given the same is pre-registered in the memory of the scanner. The number and the type of bolts you’d be getting in the safe you are purchasing depend on how much cash you are ready to spend. There are two types of bolts that are offered to the customer, one is the live bolt and the other a dead bolt mechanism. A live bolt is the one that moves when the handle of the door is turned. On the other hand a dead bolt is simply a metallic projection that acts as added support and preventive measure that keeps the door locked at all circumstances. The position of the hinges of the safe door plays a vital role in the level of safety and security safe offers to a user. It is actually a debatable topic as irrespective of the position of the hinges, the safety factor of a safe is not hindered. The only benefit one can get from the position of the hinges on the safe doors is that an externally positioned hinge allows the user to open the safe door for a total of 180 degrees. On the other hand, an internally hinged door of the safe can only be opened to a maximum of about 90 degrees. Gun safes should be fire proof. The minimum standards for a safe to be suitable for both personal and business use are when the same is resistant to 1,200 degrees Fahrenheit of fire for a minimum of 30 minutes. In case you plan to use the safe in a more professional setting, opting for a safe that has a minimum of 1500 degrees of fire resisting capability is the ideal choice. After a fire breaks out in the vicinity of the safe, the gasket of the door of the safe expands and thereby making a tight seal. There will be substantial water damage after the fire as gun safes are not water resistant. Keeping your guns high and dry is necessary for the same to last longer and function properly at times of emergency or during some hunting action. Adding some desiccant material or installing a low wattage bulb on the interior of the safe acts similar to that of a dehumidifying rod. This setup works by keeping the moisture inside the safe from condensing on the surface of the contents. ← What is a Biometric Gun Safe?